A copy of the napkin signed by Rogoff, courtesy of Tony Hopfinger. On Thursday, Anchorage jurors delivered their verdict in a lawsuit between former owners of the Alaska Dispatch. In a case that hinged over whether a promise scratched out on a cocktail napkin counts as a binding contract, the jury said yes, siding with Dispatch founder Tony Hopfinger. The decision means that Alice Rogoff, who came on as a major business partner for the online news site in 2009, is now obliged to pay more than $850,000 to Hopfinger. The Anchorage Daily News reported Thursday afternoon that it took the jury about nine hours to deliberate. 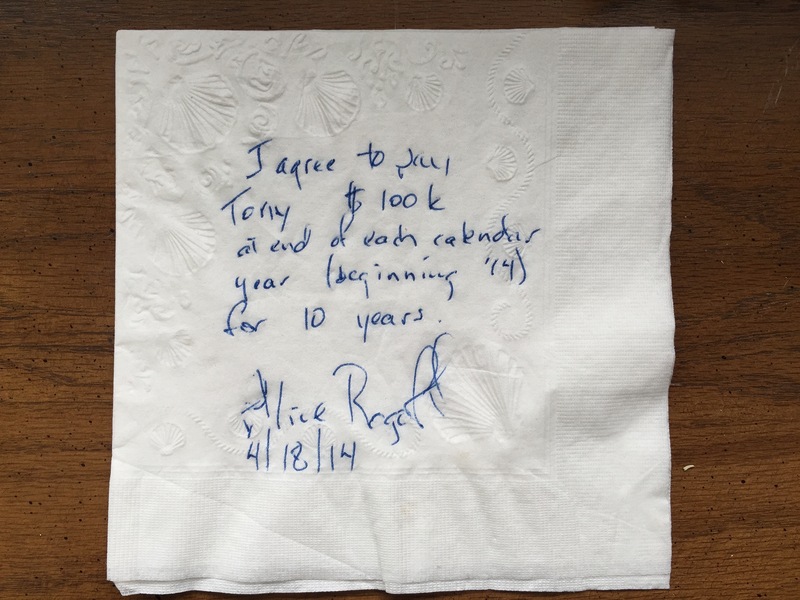 Hopfinger has maintained that in 2014, when Rogoff was on the verge of buying the ADN and combining it with the Dispatch, she solidified earlier verbal commitments by jotting them down on a now-famous napkin in blue ink. The note said, quote, “I agree to pay Tony $100K at end of each calendar year beginning ’14 for 10 years.” One installment was paid. When others failed to materialize, Hopfinger sued. The decision is another financial blow to Rogoff, who has been battling with other creditors in court over unpaid bills ever since ADN’s bankrupcy and financial troubles came to light last year. Since then there have significant dozens of layoffs at the company, and the paper has had to restructure under new ownership.